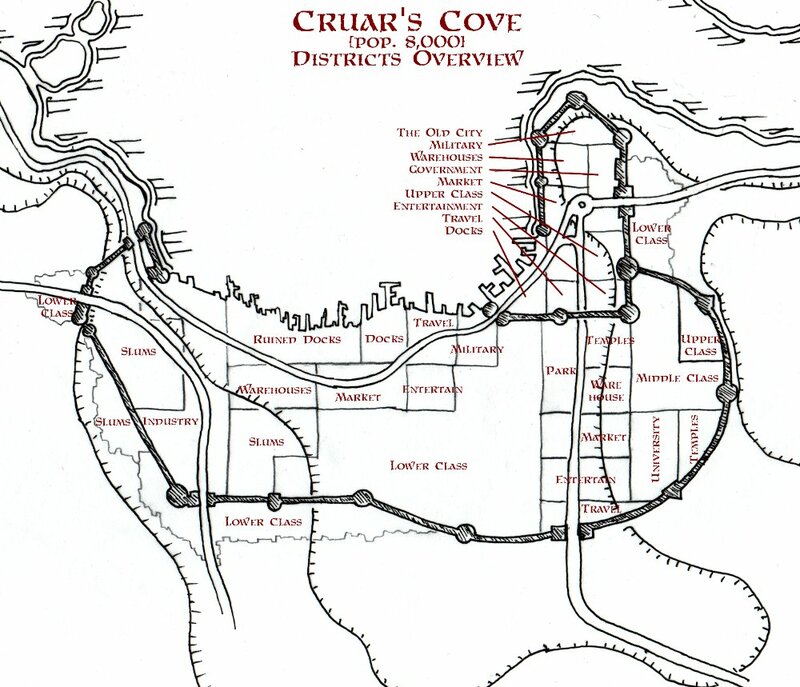 Once again we return to Cruar’s Cove for a last look at the city, as well as the strengths and weaknesses of the system used to create it. The first obvious weakness in the design process is it doesn’t include any of the minor roads. Unless you take the time to map out each of the 500′ x 500′ blocks, the city remains an overview of gross economic areas instead of a roadmap of interesting locations and how to get there. There are definitely roads that connect the various areas, plus smaller roads that go between districts. I figure there are a plethora of roads between New Gate Road (between the two souheast gates) and Ocean Road (that runs along the docks to the military / docks gate into the old city. Plus untold numbers of roads and lanes in the lower class districts (otherwise as mapped the primary lower class district has no access to the rest of the city). But none of these roads are the “major” roads that run through the city and would be indicated as “highways” on a modern map.This works fine for my own gaming style anyways, since I don’t want the players to have to “explore” the city like a dungeon environment – travel from one district to another just involves following the roads that are there, or using the few major roads when convenient. The final production of the city is something that I would love to run a game in. It is already triggering a bunch of ideas for stories and conflicts. I also like the immediate feeling of tension between the sides of town. The “new” part of the city has already degenerated into slums around the industrial base, and entering from each of the various gates will give a party a different feel for the city. Enter along the coast of the island along a fairly sheer cliff / hill face and right into the Fish Industry (fishermen, boatyards, fish processing) then through a delapitated dock area and warehousing, into the main fish market of the city with a few inns and taverns just before getting to the Old City and a district based around travel commerce and a naval base. Enter on the top of the hill itself through some lower class houses and once you are through the gate you immediately are looking down a hill into the dirtiest slums of the city before crossing into the city’s industrial area. Enter from the southwest gate right through a bunch of houses clustered along the city wall and right into the industrial end of town. This is the ultimate blue-collar gate and is probably used for a lot of shipping to and from the rest of the island. Enter the “Main Gate” and go north up a boulevard – first through horse and cart sales as well as other travel and communications commercial buildings, into a lively area of inns and entertainment aimed at travellers then into the “Great Market” where everything the middle class would want (as well as travellers) (and it slowly becomes more “homey” and lower-class oriented as you look to the west side of the market), then the road is bracketed by a huge park on your left so you don’t really notice the small warehouse area that supports the market, and then the Temple Hill right before crossing into the old city. The Old City Gate – the road follows the coast and then climbs the hill into the old city (and through some outlying homes) right into the government area and then the main market of the old city – Cruar’s Market. there is little fear of attack or invasion (which meshes well with the geopolitical environment of the Hill Islands as a whole – they were the metropolitan centres of learning under the Kale Empire, and just slowly became independent of the Kale as the empire waned and never have had to deal with invasions from the various armies of the main land during their wars with the Kale). there is little way to control anything getting out of hand in the slums, or really anywhere outside of the old city except along the Boulevard and the Ocean Road. So nice! Thank you very much for detailing this process, and providing your artwork in stages. In this case, the randomization worked, and probably the process went faster due to randomization. In my case, I have a tendency to force everything to make sense. Thus I would have had to start with the issue of how the fortress got built, and how it changed hands before the military got it, etc. That sort of story telling is time-consuming, and the results are not necessarily better than the results of a random roll. The trick is to rationalize afterwards.